The choir were pleased to give a concert at Oakengates United Reform Church on Saturday 14th July to raise funds in support of the Shoe Box Appeal, a charity that sends thousands of gifts to children overseas in the run up to Christmas, many of whom would not otherwise receive a present of any sort. It was a fitting way to end the choir’s summer season and the concert was followed by a garden party at Harley on 21st July; thanks to all those who supported either event in any way. 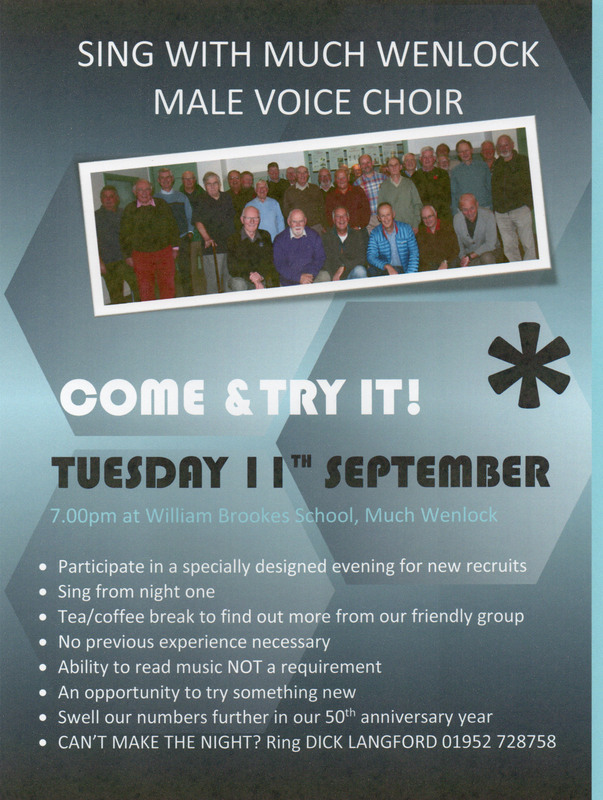 Its also pleasing to see the choir attracting new members in recent months – a ‘come and try it’ event is planned at the William Brookes School on the evening of Tuesday 11th September at 7pm….if you enjoy singing why not make a note of it in your diary and pop along. Rhos to celebrate Choir’s 50th!